The AE were designed as pollution-fighting robots, intended to save the world. However, the AE prototypes have a bug which makes them the polluters. The AE somehow slipped through quality control, out into the unsuspecting universe. The AE must be stopped! 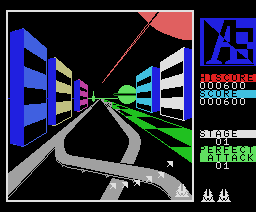 Among a lot of Colecovision and Adam goodies acquired from a former Coleco employee, NIAD came across a rom dump of the Colecovision version of A.E. on a data pack made with the In-House Coleco Cart Copier program. Originally, A.E. 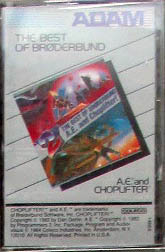 was only made available in 1984 on a compilation data pack for the Adam called "The Best of Borderbund", which also included Choplifter.NIAD has converted the data pack to a ROM Image for use with emulators. 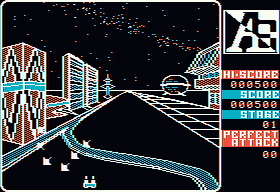 Daniel Bienvenu patched some issues in the ROM before Collectorvision published the game.